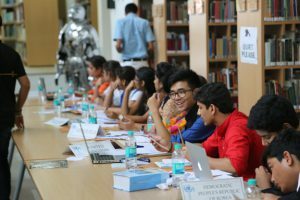 In its ninth annual session, the Doon School Model United Nations Conference began on Monday. A simulation of the world’s diplomatic realities, the conference hosts 427 delegates from 37 schools across India, Nepal, Bangladesh and the United Arab Emirates. 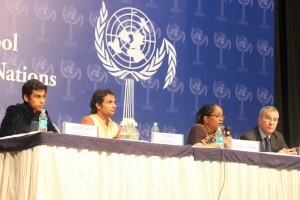 The events began at 10:00 AM on Monday morning with the Opening Ceremony. In commemoration of the 70th Year of the United Nations, the school hosted one of India’s premier diplomats – former Foreign Secretary Sujatha Singh – as Chief Guest. In her well received speech, she described India’s diplomatic policies in context of current global developments, as well as elaborated on future paths the country may take to further its interests. This was followed by an informative question-answer session with the Chief Guest. The School’s Headmaster, Dr. Peter McLaughlin; Master-in-Charge of DSMUN Mr. Mohit Sinha; President of DSMUN, Nikhil Saraf; and Secretary-General of DSMUN, Devansh Agarwal also delivered speeches on the same subject; the delegates meanwhile furiously jotting down their opinions that would prove useful in their committees.